...in doll form that is. My daughter is affectionately called "Snarky Girl" or Queen of Snarkdom because of her temperamental teenage attitude. You never know what's she's going to say or when she'll explode for any un-given reason. This seems to be typical for girls between 13 and 18. I had an idea for a doll based on my daughter for a while now but finally sat down and worked out a prototype. I'm pretty pleased with it. I have more designs for clothes and testing to do but I think they are perfect for pre-teen to teen girls. The doll is a mixture of my daughter and Japanese Anime which I love so much. The dolls will be 11 inches tall. 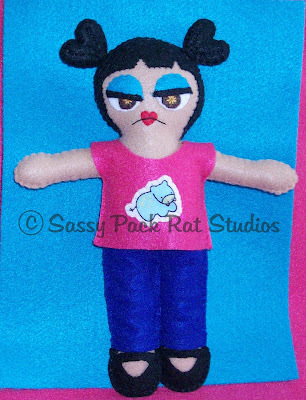 I plan to do specific girls like "Petulant Patty" and "Moping Millie" etc, that will be OOAK series dolls and also "Make A Doll Like Your Daughter/Niece/Granddaughter" with specific hair and eye color and type of clothing. 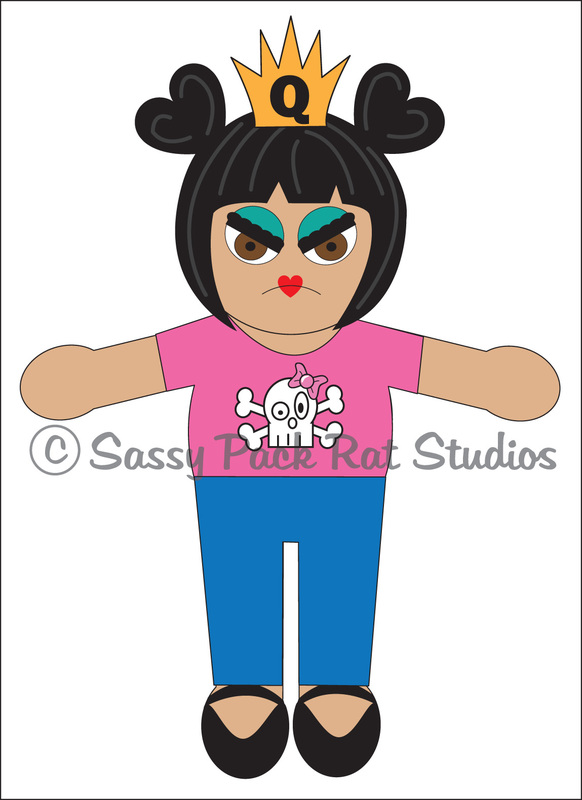 I'll also have digital prints of the various dolls available for framing for girl's rooms and possibly a paper doll set. So many ideas! I'd very much love to hear some feedback about this prototype. If you like it great. If you hate it, that's fine but please tell me why so I can improve the design. Either way thanks for taking a peek! Fabulous! 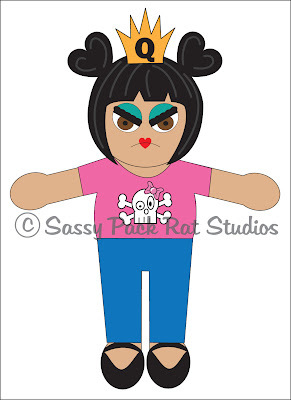 I think it's awesome that you're doing the prints and paper dolls and things as well. Awesome idea and I hope you get tons of sales from them! Love the anime influence. I think she's a fab little doll. I especially like the skully and cross bones! oh how fun! do the clothes come off? cos you know tweens need to change often, so you'll need extra clothes. in fact a whole boutique! thought of you yesterday, saw a real life shop called sassy...of course, my camera was not in my pocket. I love her! She is so cute and snarky all at once! Fantastic doll!